Save big when you buy the M4E1 Enhanced Upper Receiver and Handguard Combo! The Aero Precision state-of-the-art Enhanced Upper Receiver combines the handguard mounting platform with the upper itself, condensing the parts needed to mount a free-floated handguard to a mere 8 screws. 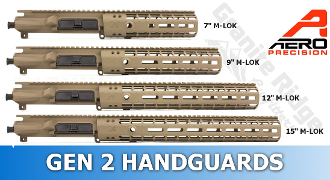 This Upper Receiver Handguard Combo now includes the Aero Precision Gen 2 Enhanced Handguard! Key features include the addition of quick disconnect sling sockets, enhanced milling design for grip and visual appeal and a new profile for the picatinny top rail.